"Hell is other people." So said Jean Paul Sartre. And he never had to travel on the Southeastern Trains service from London Victoria to Ramsgate. The journeys can be pretty horrendous, especially when populated by the kind of people that don't give a stuff about anyone else. 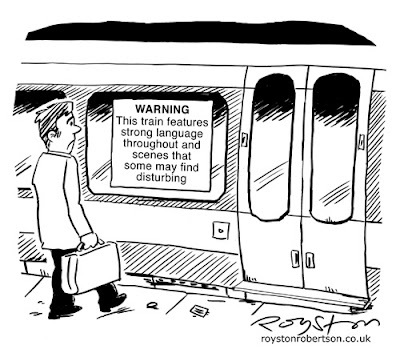 Still, at the least I got a cartoon out of this particular journey, one that appears in the current edition of The Spectator. I travel on the train between Broadstairs and London fairly regularly and often come up with ideas for gag cartoons while doing so. I sold two to Reader's Digest recently which were both thought up on train journeys and jotted down in my notebook, though unlike this one they were not about train journeys. I think it's a good place to think up ideas because you're in a captive environment, with fewer distractions. You can't just go and make some toast or surf the internet. Of course, its easier on the quieter trips. So, if you see me scribbling away on the Ramsgate to London service, please keep it down will you? And haven't you got any headphones for that thing? 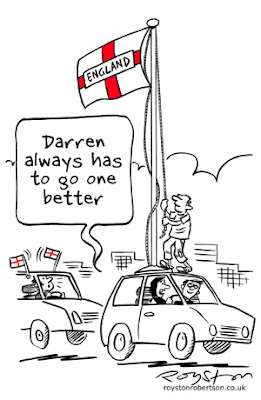 Here's an old cartoon on an "England" theme. I was pleased with the way the cartoon turned out, and it got lots of chuckles from the passing public, which is always good. Last year I followed the pencil lines a bit too slavishly, and it ended up looking a bit wonky as a result. This year I kept it much more loose, and it shows. I also added grey tone with acrylic paint, which helped. It was the best Shrewsbury festival yet, I reckon, despite the colder weather. 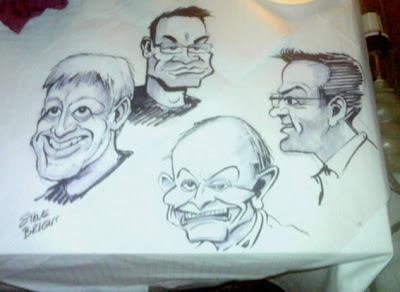 There was lots of superb work on show ... on the boards, the Humurals (a kind of mural of gag cartoons) and the many exhibitions, not to mention in sketchbooks ... and tablecloths! 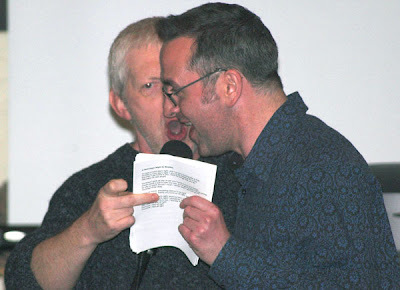 Above: Clive Goddard and Royston Robertson singing the Belgian punk-pop classic Ca Plane Pour Moi at the Saturday evening sing-song. Guitar was provided by cartoonists Tim Harries, Noel Ford and Roger Penwill. Last year a bunch of us sang this song, but the only words we knew were "Ooo-ooo-eee-ooo", but this year Tim kindly provided the full lyrics. The full French lyrics, of course. There was much improvising, especially as Clive did not have his reading glasses. Pic by Gerard Whyman. Tomorrow I'm travelling up to the Shrewsbury Cartoon Festival. There are events from Friday through to Sunday. 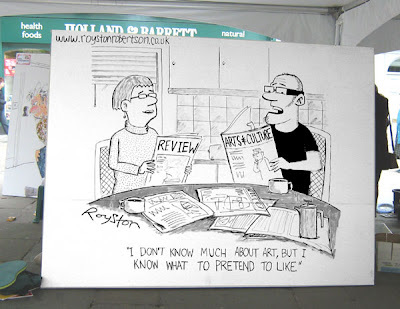 I'll mainly be taking part in events on Saturday, such as "reverse caricaturing" (you stick your head through a board, cartoonist draws a body ... like the cartoon above by Roger Penwill, only without the huge shrew), drawing a cartoon as part of a huge mural known as a Humural (geddit?) and doing a 6ft by 8ft "Big Board" cartoon. So if you're in the area, come over and say hello! Many thanks to Shrewsbury area blogger Chrissy, of Chrissy Marie's Card Craft, for the very nice plug for the festival, and for this site, yesterday. 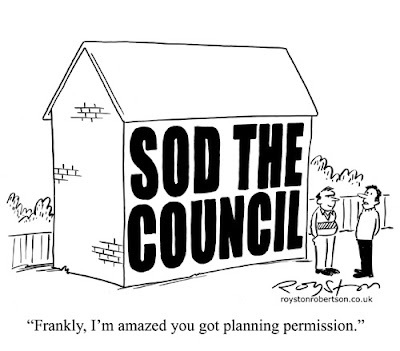 Here's a cartoon that appears in the April issue of Prospect magazine. 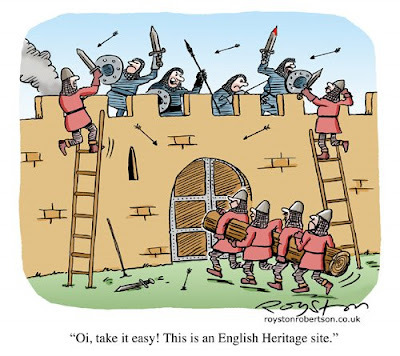 I'm no great history buff, but history cartoons are always fun to do. Last year I illustrated a series of articles on life in medieval times ("How we used to fight ... eat ..." etc) which appeared in the BBC's Robin Hood Adventures magazine, a tie-in with the TV series. 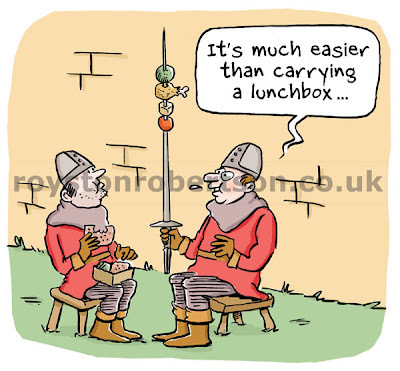 They were fun to do and I found that when the job finished I continued to think up gag cartoons on a medieval theme! 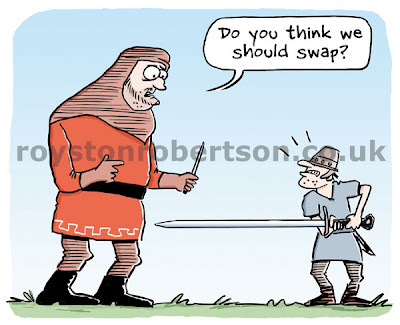 Here are a few of the cartoons from the "How we used to ..." series. 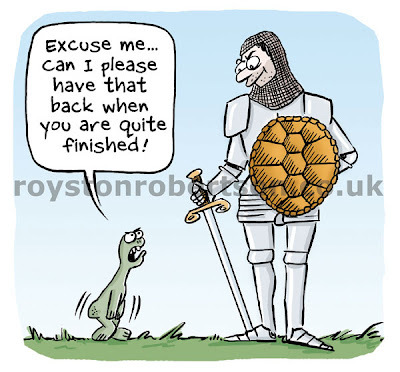 Some of the work from Cartoonists 2008 is now up on the Chris Beetles Gallery website. Click the links below. 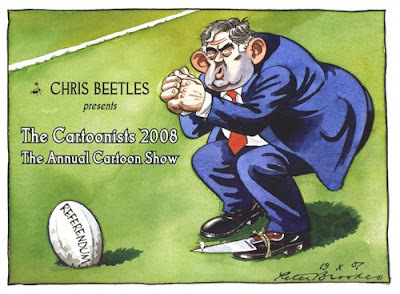 Last night I attended the private view of the Cartoonists 2008 show at the Chris Beetles Gallery. This was my first time showing work at a London gallery, so it was a pretty big deal for me. There was a small section with my work in it and a few others scattered around the gallery. Ironically, the only one I didn't spot was the one I posted here on Monday. That doesn't mean it wasn't in there though because, believe me, there was a lot of cartoons by many cartoonists in the show, every square inch of wall space seemed to be covered, so I may have missed it. To be honest, there were far too many cartoons to take in. As I've said on this blog before, cartoons are really meant to be seen in magazines and papers, and it's a bit weird seeing so many in one go. But it does give you a chance to see magnificent works by the likes of Mike Williams and Ed McLachlan in their full glory, rather than reduced to fill a two-column space. 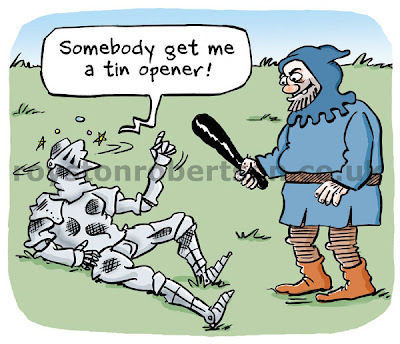 And of course, it gives people a chance to buy cartoons, which I'm certainly not knocking! The place was packed, with lots of people clearly enjoying the cartoons. 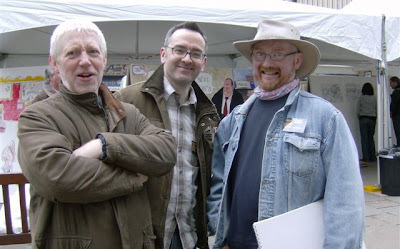 And it was a good chance to catch up with a few cartoonist pals and meet a few others for the first time. Add to this the free champagne, and the fact that I spotted a "sold" spot on one of my cartoons, and you have my idea of a good night. 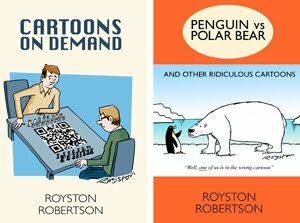 Born in Catterick, North Yorkshire, in 1968, Royston Robertson has been drawing cartoons for about as long as he can remember. At the age of seven, he wrote to the TV show Jim'll Fix It to ask if he could edit the Beano for a day. Jim never fixed it. Between school and university, instead of going to work on a kibbutz, Royston ran the comic DoodleBug with a group of friends. Part fanzine, part Viz, it built up a strong following in the North East. After university, Royston trained as a journalist, giving in to the “get a proper job” hype, and eventually worked for five years as a sub-editor at The Times. But all the time he kept drawing and selling gag cartoons and he gave up the day job in 2004. He has been published in Private Eye, Reader's Digest, The Spectator, Prospect, New Statesman, The Oldie and many other publications throughout the world. He has also drawn cartoons for Oxford University Press, Children’s BBC and Scholastic Children’s Books. Royston Robertson is now based in Broadstairs, Kent. Jimmy Savile has still not replied to his letter. I have some original cartoons, including the one above, in an exhibition entitled Cartoonists 2008 which opens at the Chris Beetles Gallery in St James's, London, tomorrow (April 8) and runs until May 3. It is the gallery’s second annual show devoted to the art of British cartooning, following on from the You Havin’ a Laugh? exhibition last year. I'm in pretty humbling company, as the show features such big cartooning names as Ronald Searle, Matt, Banx, and Simon Bond, and magazine gag cartooning heroes such as Mike Williams and Ed McLachlan. The gallery, at 8-10 Ryder Street, St James’s, London, is open from 10am-5.30pm, Monday to Saturday. Tel 020-7839 7551, email gallery@chrisbeetles.com or visit the website.